Background & Aims: Cell-mediated immunity plays a critical role in viral clearance and disease progression during Hepatitis C virus (HCV) infection. Interleukin (IL)-12 is a cytokine that has been shown to be a potent antiviral cytokine. The aim of this work is to investigate the association of IL-12 B gene polymorphism with staging of liver disease in chronic HCV patients. 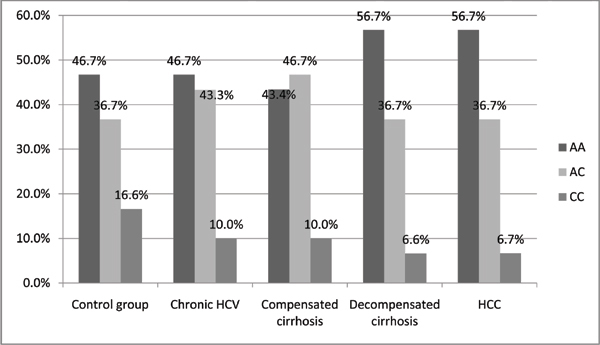 Methods: This cross sectional study was carried out in tropical medicine department, Tanta university hospital, Egypt, on 120 chronic HCV patients with various stages of liver disease and 30 healthy subjects served as control. All the participants were tested for IL- 12 B (p40) gene polymorphism. Results: the frequency of AA genotype was higher in HCV patients with decompensated cirrhosis and in HCV patients with Hepatocellular carcinoma (HCC). However, the CC genotype was less detected in all groups, with the lowest percentage (6.6%) detected in decompensated cirrhosis and HCC patients. Conclusions: AA genotype presented more frequently in late stages of HCV chronically ill patients, while, CC genotype had no significant association with staging of liver disease and had low frequency especially in late stages of liver disease. Keywords: HCV, hepatitis C virus, IL-12, interleukin -12, HCC, hepatocellular carcinoma, polymorphism. Keywords:HCV, hepatitis C virus, IL-12, interleukin -12, HCC, hepatocellular carcinoma, polymorphism. Abstract:Background & Aims: Cell-mediated immunity plays a critical role in viral clearance and disease progression during Hepatitis C virus (HCV) infection. Interleukin (IL)-12 is a cytokine that has been shown to be a potent antiviral cytokine. The aim of this work is to investigate the association of IL-12 B gene polymorphism with staging of liver disease in chronic HCV patients.